BTC/USD recovery stopped at $3,707. Bitcoin sandwiched between strong technical levels. BTC/USD was hovering around $3,600 handle after a volatile Friday when the cryptocurrency market gained over $10B in a matter of hours. While there are no clear fundamental reasons that might have explained the stellar growth, a breakthrough an essential technical resistance at $3,500 gave Bitcoin a massive boost and allowed to test $3,707, the highest level nearly in a month. The market has entered a profit-taking phase; however, the short-term picture remains positive even despite Bitcoin’s decline over $1.3% on a day-over-day basis. 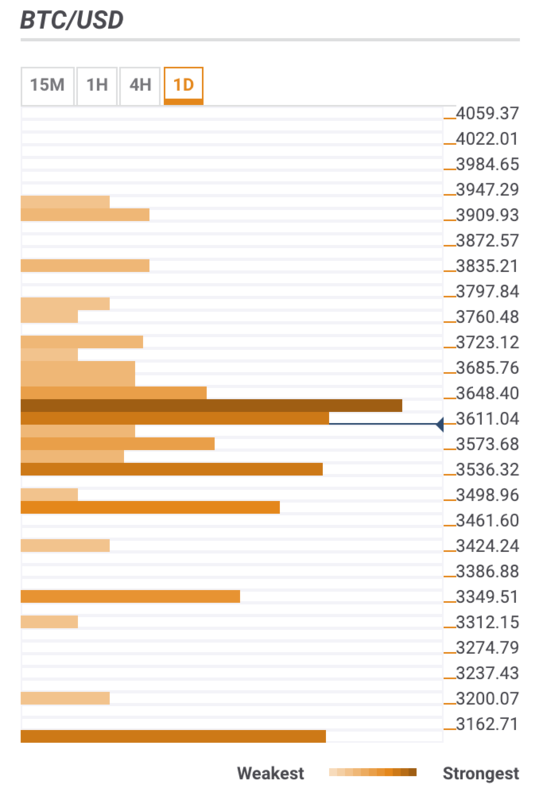 Considering a thick cluster of stain technical levels around the current price, we may suggest that the coin will continue to oscillate in a narrow range around $3,600 handle. A sustainable move in either direction will set the tone for the nearest future. BTC/USD recovery is blocked by a strong resistance zone located right above the current price. It is created by the confluence of the following technical indicators: a host of SMA levels, Bollinger Band 1-hour Middle, Bollinger Band 4-hour Middle, Bollinger Band 15-min Middle, 38.2% Fibo retracement daily, 61.8% Fibo retracement daily, 23.6% Fibo retracement weekly. To overcome this barrier, we need to see a sustainable move above $3,650 and above the recent high at $3,707. This will bring $3,900 into focus, guided by Pivot Point 1-month Resistance 3. Below the current price, the string support is created on approach to $3,550 (23.6% Fibo retracement monthly, DMA5, Pivot Point 1-week Support 3 and 161.8% Fibo projection Daily. This area is followed by psychological $3,500 strengthened by SMA100 4-hour, SMA50 4-hour, SMA200 1-hour, Bollinger Band 4-hour Lower, Fibo retracement 61.8% weekly. Previous week and Previous month low at $3,341 serves as Ain interim support that will open the way towards the previous year low at $3,127.